Have you already looked into long-term travel or researched what it would be like to live in and move to another country? Did you immediately get overwhelmed by the choices, decisions, and lack of concrete information to get you on your way? That's what happened to us when we decided to leave our country of origin four years ago. Since then, we've lived in three other countries, and we've gotten the system DOWN! Each country is different, but the principles are always the same. And, we're here to teach them to you in WorldTowning University. Let WorldTowning University show you how. We’re glad you’re here. We’re glad you’re interested in long-term travel. We’re glad you’re interested in making your life even better by living the way you want to live, escaping “normal,” and exploring as much as this world has to offer. We are Jessica and Will, and along with our two kids and a hamster named Sunshine, we are WorldTowning. We have lived in three different countries over the past four years, and are now living in our motorhome named Lemonade, traveling and working in every country in Europe. And you know what? We absolutely love it! When we left four years ago, we had no intention of making this a permanent lifestyle change. Possibly, yes, but it was not our direct goal. But what has happened since is nothing short of amazing. So we created WorldTowning University to teach YOU how you can achieve the same. We get it. Your life is extremely busy and trying to figure out every single aspect in planning to move to a new country is more than a little time-consuming. That’s why we put the course together in a very common sense order, so that you can tackle the big stuff first and finish the minor details later on. This shortens the overall process and saves you a ton of time along the way. By following our curriculum, we will be able to save you at least six months of research and frustration. Homework assignments—each of which is specially designed to move you toward your dream! WorldTowning University Autumn 2018 session begins September 4th at 2:00 p.m. EST and ends November 9th. A WorldTowning hat! Our favorite part! Enrollment is open until August 20th and classes start on September 4th at 2:00 p.m. EST. Space is limited so join now! This class is already in session. Each week, we unlock a new section for you to learn about. It includes pre-recorded course material that we constantly update whenever something changes, and you can watch it whenever you have time, as many times as you like. Then we include a resource guide with links to relevant external material for further research. Lastly, we require some simple homework to make sure you’re making progress towards your travel dream. We don’t want people to take our course just to take our course. We are in this to get you living your best travel life possible. We own a house and have a mortgage, we can’t leave. Our kids have a lot of friends at school, we can’t leave. We have two comfortable and stable jobs, we can’t leave. Our families would never support us, we can’t leave. We don’t know how to speak French, we can’t leave. We’ve never even been to Ecuador much less know how to find housing once we got there, we can’t leave. We don’t even know where to look for visa information. (Wait, we need visas?) We can’t leave. And while our fears were real, we learned that by attacking them little by little made them a lot less scary. In fact, they ultimately just disappeared. We were ready. And we haven’t looked back. We asked our students in the beta course how much they’d be willing to pay to take this course over again, and we were astonished when they said they would pay $900. So you can imagine how THEY felt when we told them we were going to offer it for only $399! Enroll now for $900 $399 before we come to our senses! We are still out here doing it. 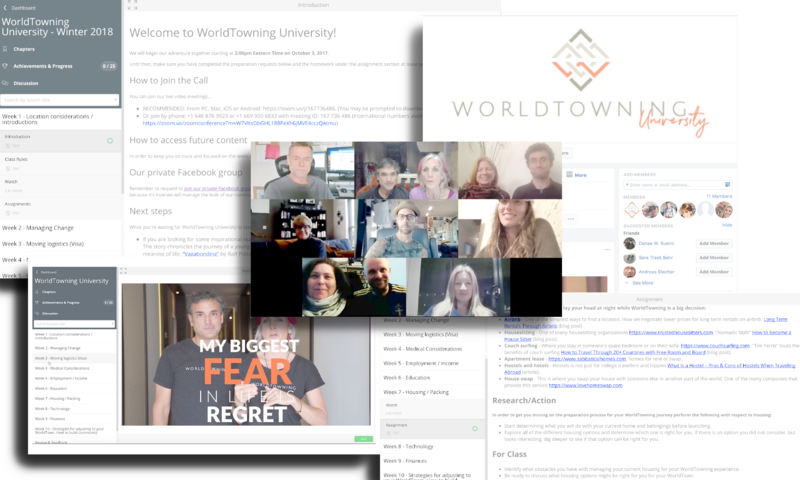 Worldtowning University is the first end-to-end travel launch class set up by active travelers. We didn’t just travel for a year and decide to make a class. We didn’t get done traveling, return to a comfortable lifestyle back home, and three years later develop a course. We are constantly learning more. We are constantly up to date. We are aware of how quickly the world of travel and planning for travel around the world can change. In addition, we are not looking to fleece you with a monthly subscription fee with the hope you might launch "one day." Instead we are working with you hand-in-hand to get you WorldTowning. On our first day in Costa Rica, we were sipping a "café con leche" on our patio and looking back at our journey to get us where we were. We realized we accomplished something pretty cool. All of those fears and excuses we held onto so that it would be ‘ok’ if we changed our minds, all of the planning, all of the wrong turns, all of the risks–everything we did, we did because we held true to our ‘Why’. What was that? To spend more time with our kids and give them a vision of the world that comes from experiences as opposed to stereotypes. While your ‘why’ may be different, it is no less important to you. And, that’s all that matters. So, four years and numerous countries later (and counting), we created this course, so that you can do just that: follow your why and make your life even better. We want to help you avoid the same pitfalls and mistakes we made. We want to relieve your stress and fears and frustrations. We want to make sure you don’t allow yourself to give up at the first sign of difficulty. We want to make sure that you go from thinking about long-term travel, to doing long-term travel. We are here for you, and so is the rest of our community. See you inside. Don't miss out on a chance to change your life! Jessica grew up in rural Maine, where she developed a love for the outdoors. Her many diverse interests have led her to wear a number of hats throughout her life – corporate graphic designer, business owner, real estate investor, avid photographer and successful blogger. In 2014 She and Will (co-founder) left their stable and secure life in Boston to start anew with the hope of creating a better and more fulfilling life for their family. Jessica wears no role more proudly than that of mother to her two children and passionate partner to her husband. When Jessica fused her love for family with her interest in the arts and her zest for adventure, her life as a worldschooler emerged. Her mission now is to take this to the next level and help as many people as possible to join the WorldTowning movement. Will, the other half of WorldTowning, is a recovering corporate accountant who now builds programs for WorldTowning clients by day and and edits vlogs by night. He is also a bit of an adrenaline and adventure junkie, a marathoner, tech junkie extraordinaire and a hands-on worldschooler. He embraces the diversity of his Cuban culture and believes it fuels his love for experiencing life with people all over the world. Currently, Will is on a quest to document the family’s journey as authentically as possible, so others can join in the discovery and exploration of the world at large. I used to dream it. Now I'm planning it! I just completed the "maiden voyage" of WorldTowning University, and it was just what I needed to turn my globetrotting fantasies into achievable goals. WTU covers everything from finances and medical issues to technology and the emotional anguish of dealing with negative friends and family. Will and Jessica have a wealth of experience in WorldTowning with their teen and tween kids, and they're eager to share their knowledge and enthusiasm with anyone willing to take the leap. The combination of the weekly live classes and the resource material included with the assignments gives you all the tools you need to put your plan into action with confidence. Without exception, The best must have course for any budding World Towner, Traveller or Nomad. Not some cookie-cutter, pre-fab course where you follow along on your own. Will and Jess provide the tools to help you dig deep, think about why, explore emotions and ask yourself questions -- and then you attend online class! After the deep-dive personal journey each week, you get to spend time with Will, Jess and guests who show you that slow travel is doable for anyone. What makes the class so perfect is that it's about you -- your journey, questions, fears, challenges and progress. And you get to share all of this with other classmates who are going through the same process, so you're not alone. We became fast friends with our classmates because we all were vulnerable about what we didn't now, which only accelerated the awareness and learning of what was possible. Part inspiration, part cheerleading, part accountability -- it's all here. If you're wondering if a slow travel lifestyle is for you, this alone would be worth kicking the tires, because after you complete the course you'll be champing at the bit to start your WordTowning adventure!